The gallery shows many examples of finished projects and you can also read more on how a project runs. Below are some of the most popular ideas to get you thinking – with an approximate guide price including all materials (excluding VAT and expenses). My costings also include any preparation time I need before I arrive. When you contact me with your questions / ideas I will talk you through any variables to enable me to send you a fully priced (no obligation) proposal. 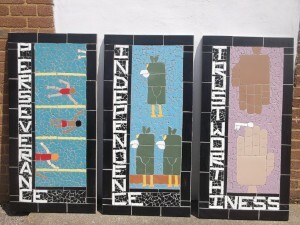 The benefits of a mosaic project are numerous, and you get a beautiful, lasting piece of community art alongside the positive outcomes for everyone involved in the creative process. 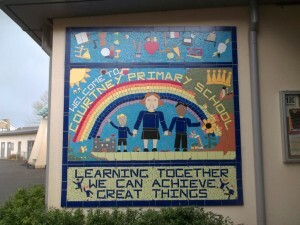 These are specifically designed to communicate school values, combining words and imagery. 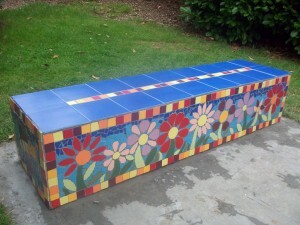 These are built up using concrete paving slabs and so can come in almost any shape and size. For the two options below, I would work with participants for between 5-10 days. 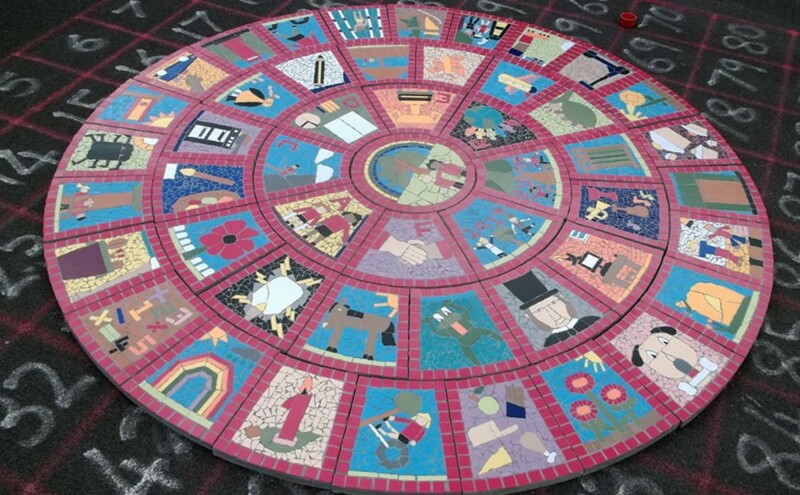 2.4m diameter mural consisting of a central circle slab (of 60cm diameter) and first ring of 8 and a second ring of 16: £2000 + VAT / expenses. However it can also have an extra element in the middle such as a column, with the cost depending on the height. 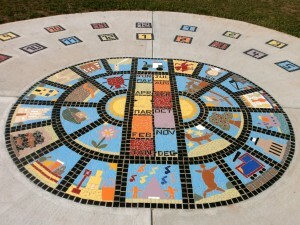 A ground based sundial which allows the person to become part of the machinery to tell the time. I would work with participants for 5-10 days depending on size/options. There would be some additional costs for plotting out and installation. Benches vary enormously in size but do contact me with your ideas – the one in the picture was a community project for a park and cost around £700+ VAT / expenses. 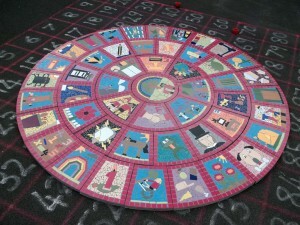 Pod seats are circular, created by mosaicing sections of ceramic drainage pipes filled with concrete (when completed each weighs around 9 stone). 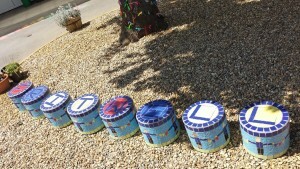 The design usually has letters so together the seats spell out a word such as “Hope, Love” and they are perfect for school friendship benches. To create 8 pod seats (see image) I would work with participants for 3 – 4 days, typical cost £1900 + VAT / expenses.